Today we still use an industrial age monetary construct while we have technologies to do things differently. Greece could create a precedent with a different way of addressing economic problems, says one of the architects of the euro, Bernard Lietaer. RT:You were one of the people who helped bring about the birth of the single currency. What has gone wrong in your opinion? Bernard Lietaer: We didn’t just change the currency, we also changed the rules of the relationships between the central banks and governments and that was not part of the deal initially. This is something that was added at the moment when the euro was launched and was incorporated in other laws and treaties. But the technical part of the currency foundation - the convergent system which is the part I was involved in when I was at the central bank in Belgium, which had the responsibility for that particular phase, that was not what we expected; that had been added. RT:Did you ever think it was possible a member state might leave the euro? BL: Actually that was decided that it would not be an option. That was part of the political conditions that we were given at the moment of the design; there would be a one-way street and it was quite clear that that was supposed to be the objective. The ultimate objective, of course, was to create convergence on a political level and on an economical level in parallel. With these additional changes that were introduced - again politically - that has not happened. We are now in a place where I frankly never expected we would be. RT:Do you think the very future of the euro as a currency is at risk here? BL: There is a lot at risk because we are playing chicken on all sides, not just the Greek side, but also the European side and actually even the IMF side. So there seems to be uncertainty being fed by all parties in this game and uncertainty is not good for anything really, certainly not for the economy or for investments and economies. So yes, there is a concern that didn’t exist before. RT:If Greece sets a precedent and leaves the eurozone, is there a danger others will follow? BL: It would be a precedent that is not part of any treaty. We are outside of the framework. But personally, I don’t believe the choice that is being given is the appropriate choice. I think 100 percent in or 100 percent out is in fact a false dilemma. There are other solutions available and what’s strange is that they are never talked about publicly anywhere. I don’t see any reason why Greece could not have two currencies: Be a participant in the euro for tourism and for shipping - which are the largest sectors of the economy. At the same time, have some new drachma, which is playing by different rules and which is providing capacity to reanimate the economy at the grassroots level, a lot easier than what happens with the euro now. So I think there is a third solution which is ‘let’s innovate’ and there are precedents for this. I know economic theory never has been assuming a possibility of having several currencies in parallel, but in practice we do. 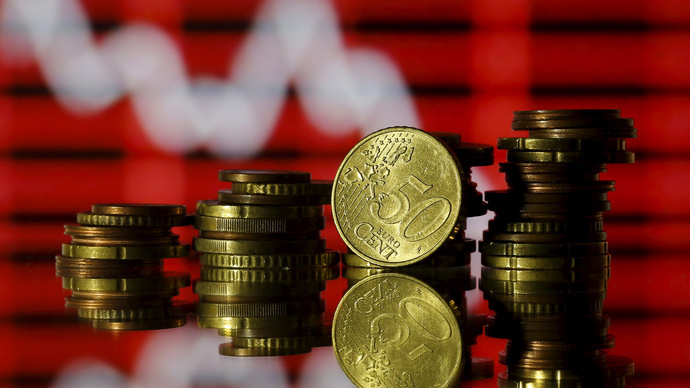 Switzerland has, for the last 80 years, has been using two currencies: the Swiss franc and a business-to-business currency, which is working in parallel and stabilizing the economy. We never talked about it but its working. In Britain, if you are a British company you can choose to have your balance sheets and your taxes paid in euro. So you can actually for all practical purposes be part of the eurozone and at the same time in a British pound economy. So these things exist. RT:If these alternatives do exist why are they are not being offered to Greece? BL: It would create a precedent for a very different way of addressing economic problems. We are basically dealing with either orthodoxy, in a classical way, or getting ready for the information age, because that’s what I believe is going to be needed and necessary and we are delaying the process. We are still using an industrial age monetary construct in a period where we have technologies to do things differently. Every Greek citizen has a mobile phone, or at least every family does, so one could create new ways of a payment system with dual currencies. And all that is possible. It has not been done before there is no reason not to do it now. It’s certainly better than what’s being debated.